1.This competition is open to residents of the United Kingdom only. 2.It is a condition of entry to the competition that these rules are accepted as final and that the entrant agrees to abide by these rules. 3.Entrants must be aged 18 or over. 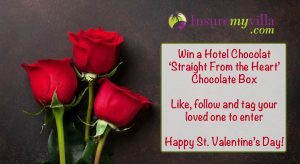 3.1.Entrants must enter via Instagram by following the Insure My Villa page (@instamyvilla), liking the competition post and tagging another Instagram user. The competition entry period begins on 18.01.19 at 12:00 and runs until 13.02.19 at 16:30. The winner will be announced 14.02.19. Only those entries made within the designated entry period will be considered. Any form of entry other than as described in these Terms and Conditions is void. 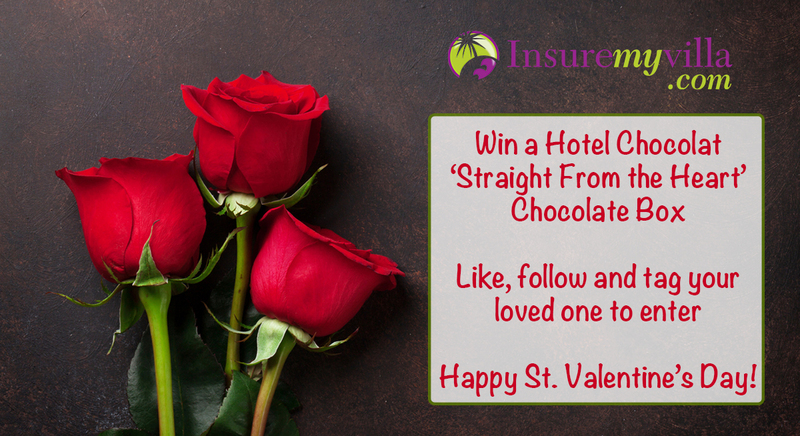 3.2.One prize will be offered – a Hotel Chocolat Straight From the Heart Chocolate Box. The winner will be chosen at random. 3.3.In order to qualify, the winner must not be a spam account, work for the group, or be associated in any way to an employee of the group. 4.Multiple entries are not allowed. No purchase necessary to enter the competition. Entry constitutes full and unconditional acceptance of these Terms and Conditions. Insure My Villa is not responsible for lost, corrupted or delayed entries, and reserves the right to disqualify anyone who violates these Terms and Conditions. 5.Insure My Villa will not share your information with companies outside the group nor use your information for marketing purposes. 6.Entries that are found to contravene these Terms and Conditions shall be null and void, regardless of the stage of the competition. In the event that the entry of a winner is declared null and void, an alternative winner will be selected. 7.The prize is not transferable. No cash alternatives are available. Insure My Villa reserves the right to substitute the prizes with prizes of equal or greater value. Insure My Villa will send the prize no later than 14 days after the competition has ended and is subject to stock availability. Substitutes may be given. 8.The winner is required to confirm acceptance of the prize, and their contact details and postal address to Insure My Villa when contacted. In the event that the winner does not accept the prize, or does not comply with these conditions, Insure My Villa reserves the right to select an alternative winner. 9.Events may occur that render the competition itself or the awarding of the prize impossible, due to reasons beyond the control of Insure My Villa and, accordingly, Insure My Villa may, at its discretion, vary or amend the competition and the entrant agrees that no liability shall attach to Insure My Villa as a result thereof. 10.This competition is in no way sponsored, endorsed or administered by, or associated with, Instagram or Hotel Chocolat. Insure My Villa’s registered office is: 30-34 Hounds Gate, Nottingham, NG1 7AB. Entry into any Insure My Villa competition constitutes acceptance of the above Terms and Conditions. This entry was posted in Ts&Cs and tagged Competition. Bookmark the permalink.